He flew B24s and B25s as a bomber pilot, serving in what was then called the U.S. Army Air Core in WWII and Korea. Lt. William P. Riley was my grandaddy. Born February 26, 1922, in Junction, Texas, he was one of five children to Minnie and William Patrick Riley, Sr. His siblings include Uncle Max, Aunt Jewel, Aunt Febajean, and Aunt Lenore. Grandaddy attended Schreiner University, a private liberal arts college in Kerrville and then transfered to Texas A&M, earning his degree in Animal Husbandry. As a member of the Core and the Aggie Band, he was an avid trumpeter who had the responsibility of playing the daily bugle call, the “Reveille”; it’s the morning wake up call for the Corps. In his senior year, he thought it would be fun to sound the traditional wake up call for the freshmen at 3A.M.! That’s my Grandaddy’s spirit right there. All fun and making life grand. In 1950, he married my Granny Beverly. Being in the service He and my Granny lived all over the world. At each place they landed, Grandaddy’s priority was always mounting the U.S. flag outside. Only then could they call it home. He was a lover of, and a maker of life. A real adventurer. He had a thirst for knowledge and in so doing, he knew a lot about a lot of things. He loved history. In fact, my mom recalls that on many road trips as a kid, there wasn’t a Texas historical marker that they didn’t stop to read and talk about later. He loved Texas rivers, especially the Llano in Junction where Grandaddy took my mom and uncle on many expeditions. He loved the detail of life, he loved making life fun. Grandaddy Riley’s greatest love was flying. He first fell in love with airplanes at the early age of 11. His Uncle Hez, a Veteran pilot of WWI took him on his first plane ride. Determined to learn to fly planes, Grandaddy Riley’s passion took off. His military service lasted 10 years. He loved planes and flying. He loved his country. 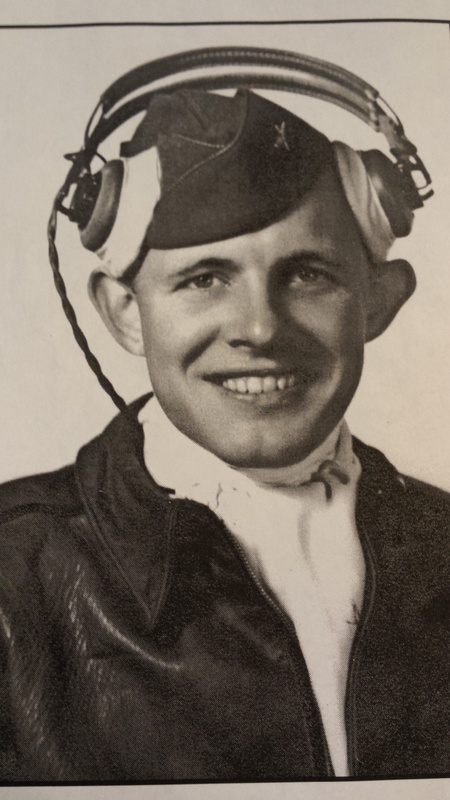 Before retiring from the service, Grandaddy was a test pilot for Air Force planes being refurbished and repaired. I think it took just a little bit of crazy + courage to be this kind of test pilot since he was the one to determine if the planes were air worthy. That’s my Grandaddy, fearless. To complete his career, Grandaddy Riley took a civilian job with the Federal Aviation Agency as the Chief of Weather, stationed at the Midland International Airport. Eventually he moved back to Junction to live out his life. Grandaddy loved the detail of life which probably accounted for him being an expert map reader. He loved people and was a master story teller. I think Grandaddy Riley saw life as a canvas just waiting to be painted. His cup was always half full. I believe his positive spirit carries on in our family today, passed through to my mom and now me. By nature he was daring, fearless and adventurous. That was the life of Riley.